Making a contribution of code to the project will first involve forking one of our repositories, making changes, committing them, creating a pull request back to the original repo, and then updating the appropriate part of documentation. 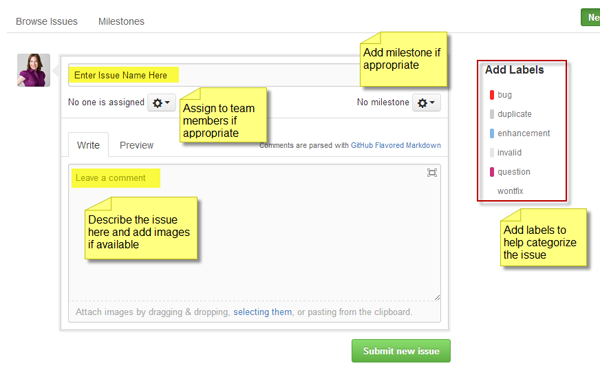 An alternate way to contribute is to create a new GitHub repo yourself and begin tackling some issue directly there. We can then fork your repo back into the OpenWorm organization at a later point in order to bring other contributors along to help you. This page contains a list of repositories maintained by the OpenWorm project on GitHub, provides simple instructions for how to access GitHub, contribute and resolve issues, opening new issues, and creating Gists. View the full current list repositories of repositories on GitHub. To access the OpenWorm organization on GitHub and fully participate on issues, you will first need to create an account if you do not already have one. Note, you can comment on issues without a GitHub account, however, we recommend joining to maximize your ability to contribute to OpenWorm. Accounts are free and can be created on the Github website. On GitHub, click the Fork button on a project to create a "copy" that you can then modify independently. To fork an OpenWorm repository, go to the repository's page and hit the "Fork" button. GitHub will copy the repository to your personal repository. You can then make changes to the repository. Once you are done with the changes, commit them back to your personal account. Then hit the 'Pull Request' button on the repo page under your account. This will create a pull request asking the OpenWorm team to review, comment and merge the changes into the original repository. This follows the so-called 'fork and pull' model. For further details on doing this, check out the help page from Github. To find issues that are relevant to your skillset and interest, first browse the list above and look for tags related to areas of functionality and coding language. Alternatively, you can view a specific repository and the filter by tags related to the type of issue and coding language. Click on the issue name to open the details. Feel free to explore and dig around. After logging into GitHub, select the OpenWorm organization and then click on the repository in which the issue is located/relevant to. Click on the Issues tab on the menu to the right. Next, click on the New Image button in the upper right corner of the screen. Add labels to categorize the issue such as what language is being used, issue status (not started, working, etc.) and what function the issue is related to. Finally, click on Submit New Issue. Issue: Summarize the issue at hand and provide links when possible to relevant code, databases and information. Motivation: Provide a reasoning for the request and what resolving the issue will fix or what purpose it will serve. Steps: Create a list of specific steps that need to be completed to resolve the issue. Links to relevant code, databases, documentation and related issues are strongly recommended. Check out this example of a clearly written issue that follows best practices. Gist is a simple way to share snippets and pastes with others. All gists are Git repositories, so they are automatically versioned, forkable and usable from Git. You can create a new gist here. Read the latest news and updates on Gists at GitHub. Already existing repositories can be transferred into the OpenWorm GitHub organization via the "transfer" mechanism provided by GitHub. New repositories can be created under the OpenWorm GitHub organization by request. In historical practice, OpenWorm members have chosen to use the MIT open source license for their repositories. The ultimate choice of license is up to the the authors of a given repository, but we would ask that all OpenWorm repository authors choose some open source license for your repository and display a LICENSE file in the root of the repository to make it clear how to use it.